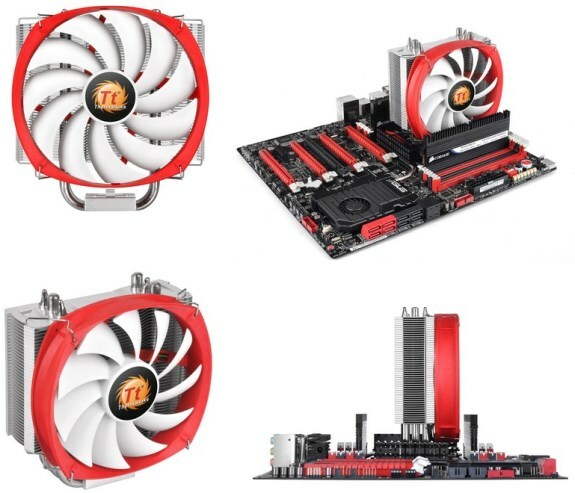 ThermalTake introduces the L31 and L32, two new processor coolers in its NIC (non-interference) series. Thermaltake, an industry leader in computer chassis, thermal solutions, and power supply units announces the most innovative product, NiC Series CPU Coolers. Incorporating the latest proprietary technology, Thermaltake introduces to the world the all new NiC series in 2014 (L31/L32), inspired from its name “non-interference cooler”, fully compatible with RAM of all kinds, ideally for power users who fill their RAM slots with taller high-end overclocked RAM. This also brings the air cooler industry another level towards silence, performance and compatibility. NiC L31/ NiC L32 solves the problem that high performance RAM and CPU coolers cannot co-exist in the past, it achieves the best RAM clearance allowing user to install high end overclock RAM with coolers with ease. Three solid ? 8mm Direct Contact Heat-pipes conduct the heat effectively, support up to 160W (L32:180W). This ensures the best possible heat dissipation performance conducting heat effectively. The slim-looking fan frame is designed to avoid interference with other components on the motherboard achieving a low total height of only 140mm (L32:160mm). Spin speed from 500 - 1800rpm automatically. Additional fan can be added. NiC Series, the all new CPU air cooler design which features a slim tower side flow design, low profile PWM Fan, efficiently optimizes cooling performance while allowing optimized compatibility with RAM of all kinds and also enabling the user to adjust the fan speed more conveniently.